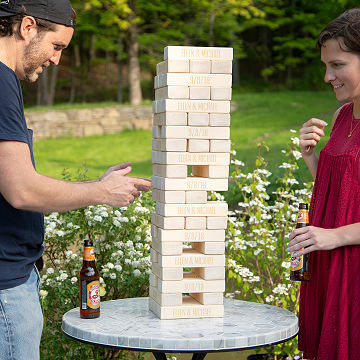 Kasey and Justin Pearson's extra-large, personalized block stacking game is big fun. This stack of blocks starts off sturdy. A few turns later it's a bit precarious. Eventually it's a teetering tower and you're holding your breath with every move. These aren't the itty bitty bricks you've played with on your table top, either. Each oversized piece in this handcrafted game is about the size of a blackboard eraser, so they're easy to grab and work well outdoors. The set stands at two feet tall—before you turn it into a wooden skyscraper. Alternating blocks are engraved with the names and date of your choice, making it a unique wedding or anniversary gift for a game-loving couple or an interactive alternative to a traditional guest book. (Folks sign the blocks as they pull them from the stack and participate in the balancing act.) It even comes with a sturdy carrying sack, so it's an easy way to add big fun to picnics and parties. Handmade by Kasey and Justin Pearson in Greensboro, North Carolina. Bought this for friends getting married. They said it was one of their favorite gifts from the wedding!